DANYANG, South Korea—Hansam System recently installed a complete Martin by HARMAN lighting solution at Suyanggae Light Tunnel, South Korea’s first multimedia tunnel – using the latest videos, sound facility and LED Media-Façade. Suyanggae Light Tunnel was originally built in the early twentieth century as a railroad, but has spent the last three decades vacant. Thanks to revitalization efforts by the Chunho Corporation, the tunnel reopened in July 2017 as one of the region’s top tourist destinations, attracting hundreds of visitors each week. The Light Tunnel itself was divided into five different spaces for culture and the arts. The interior space of the tunnel was transformed into a spectacular lighting concert hall, decorated with cultural and artificial elements. Whereas the exterior spaces were converted into a garden of lighting (secret garden) with LED roses. 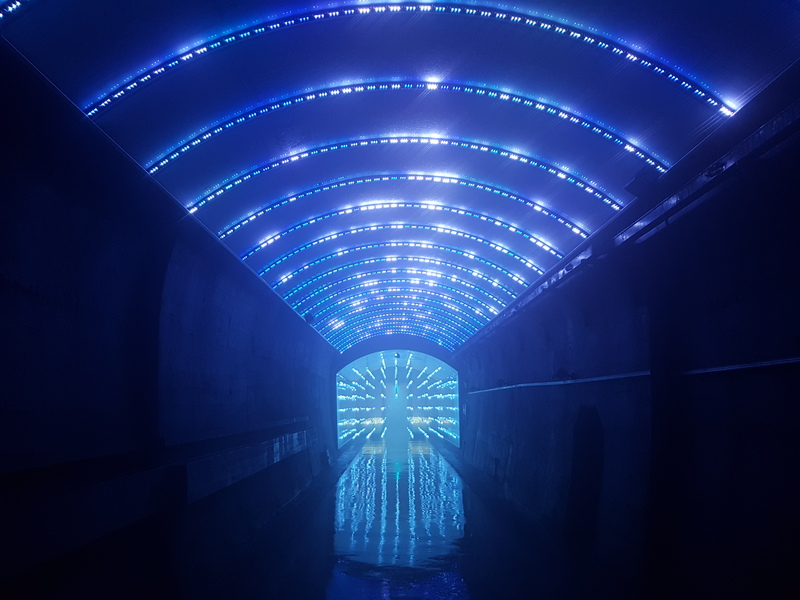 Hansam System was called in by Chunho Corporation to design and install a lighting solution that would creatively illuminate the interior and exterior of the 650-foot tunnel. After careful consideration, Hansam System selected a full array of industry-leading Martin fixtures for their unmatched reliability, superior color-mixing and dazzling effects. Hansam System used a wide range of Martin fixtures to enhance the visual ambience in the tunnel. Twelve RUSH DC 1 Aqua fixtures are mounted on the ceilings to provide brilliant aquatic effects, while two MAC Axiom Hybrid fixtures deliver beam, spot and diffused wash looks. Six RUSH MH 6 Wash fixtures are installed on the tunnel’s sidewalls, offering spectacular color mixing and moving head functionality. Sixteen RUSH MH 4 Beam fixtures supplement the MH 6 Wash lights with stunning mid-air looks and effects. Twenty-four RUSH Scanner 1 LED fixtures create dramatic atmospheres and dynamic effects that boost the visual impact of the attraction. Two Atomic 3000 DMX strobe fixtures mounted on the ceiling and wall deliver stunning backlight illumination and creative high-impact visuals. Two JEM Compact Hazer Pro hazer machines supply atmospheric effects within the tunnel’s interior. The entire lighting solution is connected via four Martin RDM 5.5 Splitter devices, which maintain proper DMX data between the fixtures across the long runs needed to span the length of the tunnel.